From the first day of the US-UK occupation of Iraq, the occupation began to undertake a series of measures, directly or through its local allies, to destroy Iraq as a state and a nation and to partition it along ethnic and sectarian lines. Today, the puppet government of the occupation and its Kurdish partners are trying to hold a population census in Kirkuk province whose aim is to give a permanent legal character to the criminal social engineering, ethnic cleansing and demographic changes that have been implemented under occupation.1 This could unleash a full blown civil war across Iraq, and potentially lead to its partition and a consequent regional war. In addition to the death of more than one million Iraqis, the ethnic cleansing and other means pursued by the United States, United Kingdom and their allies in order to implement the process of partitioning Iraq, in its cities and regions, have caused the forced migration of 2.5 million Iraqis out of Iraq and the forced displacement of 2.5 million others from their homes inside Iraq. 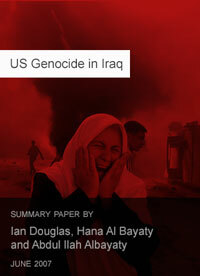 The ethnic cleansing suffered by the population in the provinces of Mosul, Diyala, Salahuddin and the Baghdad area, and most notably in Kirkuk and the so-called “disputed areas” — where the population is forced by various means, including systematic assassinations, bombing civilians, collective punishment, transfer, displacement, deportation and other crimes against humanity, to migrate only to be replaced by people from other provinces or even from outside Iraq — is a clear crime of destruction and part of the intended partition of Iraq. International law considers the systematic transfer, deportation or displacement of population a crime against humanity.3 Residents of affected areas, the Iraqi national forces, the displaced, and the majority of the people of Iraq declare this census null and void. It has no binding legal consequences and cannot and should not be used to support or justify the intended partition of Iraq. We demand that no census be conducted before the free return of all Iraqi refugees. We demand that the question of ethnicity not be used to instigate the partition of Iraq and that it be removed from any census, now and in the future. We declare as fraudulent the justification under occupation of a census on the basis of long term planning in the context of a temporary and unstable demographic situation. We demand that the United Nations and the Arab League and all governments, personalities, organisations and institutions support the demands of the people of Iraq by not recognising the results of this census, and by not assisting in conducting it. This census is designed to reward criminals for their crimes at the expense of their victims. Please sign to support this statement. Nicolas Davies USA Author of Blood On Our Hands: the American Invasion and Destruction of Iraq.